SSC normalized scoring method Exam Update : Staff Selection Commission (SSC) has decided to changes the scoring method for its recruitment exams. The commission has announced that it will adapt the normalisation scoring method in a bid to normalize the scores of candidates for the examinations which are conducted in multi-shifts. It will follow the method for its recruitment examination from 2019. SSC has announced in a short notice to adapt the normalization scoring method for those exams which are conducted in multi-shifts to take into account any variation in the difficulty levels of the question papers across different shifts. AS SSC conduct its exams of SSC CHSL, SSC CGL, SSC GD Constable in computer-based modes in various shifts and days. Thus the above system will adapted by Commission from 2019. According to the short notification released by the Commission, the normalization is done based on the fundamental assumption that "in all multi-shift examinations, the distribution of abilities of candidates is the same across all the shifts". This assumption is justified since the number of candidates appearing in multiple shifts in the examinations conducted by the Commission is large and the procedure for allocation of examination shift to candidates is random. 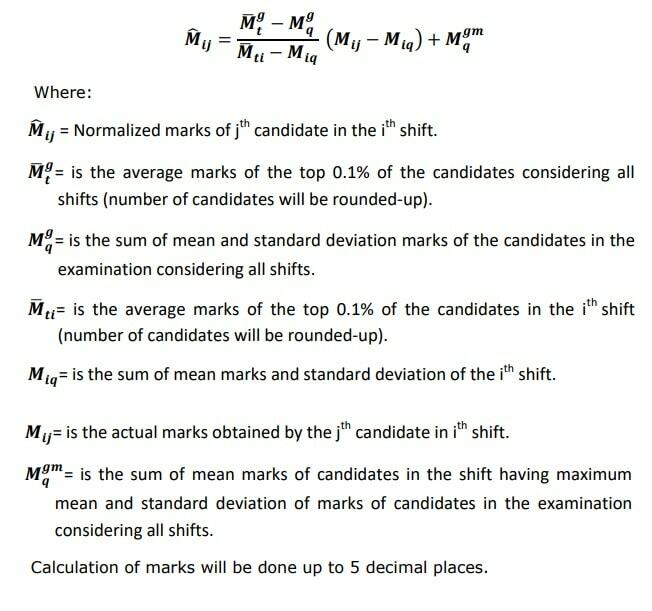 The following formula will be used by the Commission to calculate final score of candidates in the multi-shift examinations.